Yamaguchi University is the third oldest national university in Japan and traces its origins back to Yamaguchi Kodo, a private school, founded by Ueda Hoyo, a feudal clansman of Choshu Province in the late Edo Period (1815). In 1949 it was reorganized to become a national university consisting of five faculties. Throughout the years since the university has expanded into a comprehensive university which boasts nine faculties and eight graduate schools. The year 2015 marked the 200th anniversary of the establishment of Yamaguchi Kodo. Yamaguchi Prefecture can be accessed in 1.5 hours by air from Tokyo, 2 hours by bullet train from Osaka, or 35 minutes by bullet train from Fukuoka. 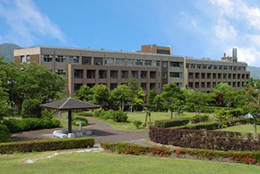 The university has three campuses: Kogushi campus and Tokiwa campus in Ube　City, and Yoshida campus in Yamaguchi City. Yamaguchi University has the faculties of Humanities, Education, Economics, Science, Agriculture, Veterinary Medicine and Global and Science Studies at Yoshida Campus, the School of Medicine and Health Sciences at Kogushi Campus and the Faculty of Engineering at Tokiwa Campus. It also has Graduate Schools of Humanities, Education, Economics, Medicine, Science and Technology for Innovation, Agriculture, East Asian Studies, Innovation and Technology Management, the United Graduate School of Veterinary Sciences and The United Graduate School of Agricultural Science. More than 430 international students from 39 countries are studying at Yamaguchi University as of May 1, 2017. Most are students from Asian countries, but they are joined by several students from Africa, Europe and America. Japanese language courses are offered to international students on an optional basis. There are courses for beginner, intermediate and advanced students. International students can take any of the courses free of charge at a level appropriate to their Japanese ability. All of the courses are accepted as credits for undergraduates. Moreover, students who do not need credits but are still interested in the classes can audit courses with permission from the lecturer. Graduate students can as a general rule use the tutor system for up to one year. Under this system, Japanese senior 3rd year) undergraduate students help international students with their studies and daily lives. Each international student will be matched with one supporting Japanese senior student. Appointing professors to guide international students. - Advice on psychological and health issues. The advisory staff maintains close contact with their counterparts in the Health Center, especially concerning psychological issues. - Advisory services are available in Japanese, English, Chinese, and Korean. In the advisory room, international students can consult with advisors in their native language. - Acts as a liaison with the local community, helping international students get involved in local festivals, community activities and more, so that they can interact with local people and traditions. 1) A research supervisor for each student is appointed prior to their arrival in Yamaguchi depending on the research proposal, so that students may start work immediately after their arrival. Thesis instruction is conducted in a multidisciplinary manner by appointing one main supervisor and two sub-supervisors for each student. The main supervisor guides the students throughout the research program, providing practical, face-to-face research advice. 2) Informal gatherings for discussion with graduate students are held every year concerning topics ranging from the curriculum and the research advise system to academic and daily life support, in order to improve course management and education quality. Parties and gatherings are planned with consideration to religious restrictions. Attention is also given to family members accompanying students in regard to daily life, social life, and health, in close coordination with volunteers from the local community. 3) Most supervising professors hold periodical tea parties or lunch sessions to encourage interaction and friendship with Japanese students and allow international students to expand their personal networks. 4) A short visit of about one week to local and central public administration offices is conducted yearly, based on the research needs of each student. This experience allows students to acquire a practical understanding of effective public administration and serves as a basis for comparative study of various aspects of public administration. Past years have included visits to Ministry of Finance, Ministry of Health, Labour and Welfare, Ministry of Foreign affairs, Ministry of Internal Affairs and Communications, and Embassy of Bangladesh in Japan. 5) A short visit to a local city is conducted after submitting the master’s thesis to investigate the industrial development of the local city. Students take a lecture on an industrial policy being implemented in the local government and visit several places related to agricultural industry, manufacturing industry, service industry and sixth sector industry. The main industry in Nepal is agriculture and with no other industries which might lead to Nepalese economic development, the economy remains in stagnation. Most of the poor live in rural areas and economic disparity is widening. The new constitution was only adopted recently in 2015, and Nepalese society remains politically and socially unstable. In order to solve these problems, (1) economic and social infrastructure development, (2) sustainable growth taking into consideration the natural environment and disaster prevention, (3) poverty reduction in rural areas, (4) efficient public administration, and (5) the strengthening of regional administration system will be needed. Our graduate school of economics has a wide range of academics whose research fields are economics, management, law, mathematics, sociology and psychology. Our graduate school includes members who have extensive experience of working for JICA which is made use of in lectures and seminars in the field of socio-economic development. Our graduate school aims to provide graduates with the skills required to play important roles in the establishment of democracy and enhancement of policy management, based on the thinking that careful planning and implementation of public policy, strengthening of decentralization and local government finance, and reform toward a more democratic and efficient administration system are the most important educational objectives for public administrators in Nepal. The Graduate School of Economics maintains experienced professors in the field of policy development projects in various Asian developing countries as well as experts in East Asian studies. Specialized professors specially designated to work with JDS Fellows are also admitted to provide practical guidance and supervision to their specific needs. There are also professors in the faculty of engineering who have expertise in remote sensing useful for disaster prevention. The Public Administration Course at the Graduate School of Economics has accepted 16 cohorts of JDS Fellows as of 2017, and the resulting accumulated knowledge related to needs of public administrators in developing countries has allowed policy improvement issues to be well understood among the faculty members who provide teaching and support to JDS Fellows. The public administration course is offered entirely in English, thus providing an　environment in which to pursue academic research, supported by a strong, judicious supervisory program. In order to obtain the skills required for the creation of a master’s thesis in the field of social science, an academic writing course is provided as a compulsory component of the program. Compulsory elective courses such as Public Administration, Principles of Administrative Law, and Program Evaluation are offered in order to allow students to acquire the knowledge and ability for public administration, policy making and administrative evaluation. Compulsory elective courses such as Economics, Public Economics, Development Economics and Public Finance are offered in order to allow students to acquire the knowledge of economics needed for public administrators. A comprehensive range of elective courses is offered to allow students to learn basic and applied research in the field of public administration, economic analysis of development challenges, and analysis of and solutions for specific development issues. Students are encouraged to pursue a deeper understanding of their research theme through regular thesis instruction. An instruction course is offered before coming to Japan so that students can have a smooth start to their research. Special programs are offered to improve students’ abilities in mathematics and English. Other ad hoc programs such as discussion with relevant government officials invited from various government sectors are conducted depending on the needs of individual research proposals. A preparatory instruction course is held in Nepal before new JDS fellows come to Japan. We discuss the detail of research plans and basic knowledge regarding research plan is lectured. Students make interim thesis presentations in Nepal to improve the content of their Master’s study by inviting questions and comments related to their thesis from fellow officials in their ministry or institution. Objectives: To acquire the basic skills required in the study of public administration management such as thesis writing skills, mathematics for economics and economic statistics. Objectives: To acquire fundamental knowledge and skills required in the implementation of public administration such as public economics, public administration, program evaluation and others. Objectives: To study advanced topics related to public administration and other subjects to allow the acquisition of the theories and specified knowledge required in the implementation of efficient public administration. *Additionally，students must take in the first year, Seminar IA (2 credits) and Seminar IB (2 credits) and in the second year, SeminarⅡA 【Thesis Instruction】(2 credits) and SeminarⅡB 【Thesis Instruction】(2 credits). # Refer to the curriculum chart for each professor’s field of study. In the Graduate School, when a student is admitted, supervisory professors are appointed beforehand depending on student’s specific area of study. Those professors are prepared to start supervision immediately after the arrival of students. Concerning thesis writing, vice supervisor is appointed at an early stage providing generous and careful guidance. Yamaguchi University has 2 International Houses as dormitories for international students, 1 in Yoshida campus, the other in Tokiwa campus. The maximum length to be an occupant of an International House is basically 6 months, but if the International Student Center (ISC) allows the extension of the stay, students can stay longer. When students start to live there, a deposit fee is required. The room is classified into single, couple and family type equipped with refrigerator, washing machine, air-conditioning, bed and study desk. The ISC selects the residents of the International Houses in January for the residents supposed to move in between April and September; in July for the residents supposed to move in between October and May next year. Every year, the number of the students who want to live in the International Houses exceeds that of the rooms we can supply. So ISC casts lots for the residents and considers the students’ length of stay in Japan, their status of international students, etc..
Four-storied research building was inaugurated in April 2010 for graduate students. Research rooms are allocated, each room with up to eight students. The study desks and room numbers at Graduate School of Economics are designated at the time of registration so as to be able to start immediately after the enrollment ceremony. Each room is equipped with air conditioning, washing stand, printer, etc.. The central library was renovated and built an extension in April 2014. Additionally, the library of East Asian Study Institute is available at the Faculty of Economics where students can find more than 780 series of specialized journals and periodicals. Special collection for JDS students is also available equipped with study desks. Trained staffs are on standby to give advice and support to students looking for specific data or academic information needed for research works. Students are allowed to take up to 1,200 sheets of copy per year free of charge. The Public Administration Course at the Graduate School of Economics is awaiting Nepalese students. We look forward to using our deep knowledge about Asian developing countries, their historical evolution, and their governing structures. Professors with experience working for JICA are available to instruct you on your research theme. Students have opportunities to experience Japanese culture and traditional events through interaction with a welcoming volunteer group for the support of international students, such as forming an international student team to participate in the local sports festival. Yamaguchi is a region richly endowed with nature, and living costs are lower than in metropolitan areas. Yamaguchi University is the best choice for students who want to engage in research and enjoy Japanese culture and daily life. Yamaguchi University is located in Yamaguchi city, the capital city of Yamaguchi prefecture. This is the third oldest university in　Japan which was established in 1815. I am very much impressed with internal and external environment of the university. Sound and supportive academic environment, appropriate and sufficient physical infrastructure, experienced professors, and a peaceful environment are some of the features of the university. Among the various academic disciplines, the university has offered the specially designed Public Administration Course in Graduate School of Economics with highly -experienced and specialized national and international professors. JDS fellows and many other international students are enjoying this course. The university provides individually assigned professor as a supervisor for academic supervision and to guide the research work. Senior Japanese students, with English language proficiency, are also assigned as tutors to facilitate study and daily life in Japan. The university's education system is based on semester system. Evaluation criteria are different as per the design of the course and include term papers, presentations, written examinations. To introduce the Japanese public administrative system, the university organizes some visits to central and local governmental offices and holds interaction with the concerned government officials. Professors periodically organize different talk programs among international and Japanese students from different faculties to interact about various subjects like education system, economic activities and so on. The university has two special dormitories within the university premises for international students with excellent facilities. Dormitory rooms are categorized as single, couple and family type. Likewise, the university has an International Student Support Center to help the international students with difficulties related to study and daily life in Japan. The university provides free high-speed free internet service throughout its premises. Some Japanese language classes/ courses are offered on optional basis with free of cost in the university. According to my experience, Japanese people are very kind, cooperative and warm-hearted. There are several community and volunteer organizations outside the university. They frequently organize several cultural programs to facilitate interaction among national and international students and local community, to exchange cross- country and cross and cultural activities. They also provide opportunity for overnight field visits, home stay experience, cultural competition and exhibitions. I am very happy and proud to be a student of Yamaguchi University.